Here is the Lindenhof Farm, an 85-acre farm in Pennsylvania. I should note that hormones are not allowed in poultry farming, but antibiotics can be used. 1. What are the important differences between the two operations? 2. What are my first reactions to the two different operations? 3. What kind of turkey operation do I want? After the “Back to the Start” commercial Chipotle aired during the Grammy Awards there has been quite the response. My response has been very positive because it highlights what industrialization of the food supply has done to the livestock industry in the last century. However, other people have had quite negative responses. There’s even a video out there that purports to tell the “real story” about modern farming and its virtues. The one criticism that keeps haunting me is that advocates of conventional farming don’t like the term “factory farming” and vehemently oppose its use because they feel like it’s a mischaracterization of how they raise their animals. My goal is to show you otherwise. Modern CAFOs (Concentrated Animal Feeding Operations) are indeed factories. Factory, when applied to farming, has a negative connotation. That’s why those accused of participating in a factory farm system feel attacked by the term. That’s one side of the coin. The other side of the coin is the persistent theme of “mischaracterization.” Most proponents of factory farming don’t see it as factory farming – it just doesn’t strike them that they’re a factory or they’re doing anything in a way that might upset sustainable farmers and members of the public. Conventional describes the vast majority of farms in the USA. A lot of good people work on these farms. That’s really not the issue here. Sure, there are some bad apples that show up in the news for overt animal abuse and other poor practices. But the majority of farmers in America are hardworking good people. So when conventional farming is attacked, even questioned, people get nervous and feel defensive. It’s their way of life. It’s how they provide for their family. It’s part of their lives and they’ve most likely grown up around conventional farming. It’s not my goal to demonize farmers or their families. The problem with conventional farming is the system. Farmers are forced to do things a certain way. It’s a system of mechanization and profits over people controlled by the industrial food complex. If you don’t think there is such a thing as the industrial food complex…try and save your seeds you bought from Monsanto. Hint: they will blacklist you and you will meet their lawyers. This idea needs to be refuted. 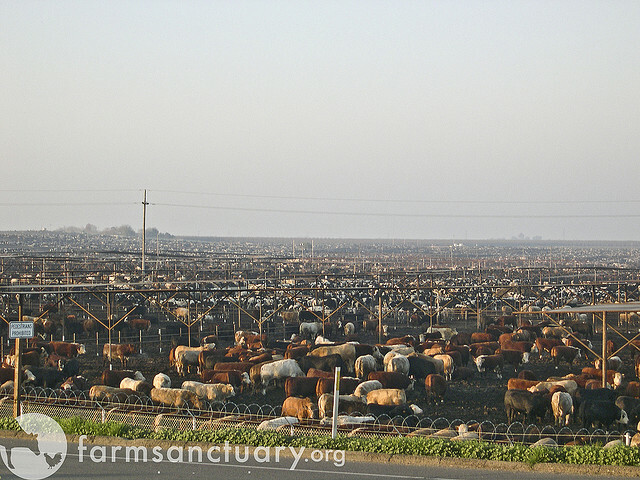 Factory farming is quite an accurate term to describe the vast majority of how livestock is raised in America. Let me show you in brief why this is true. High Density, Low Cost: Bigger, better, faster, cheaper. That’s the mantra of conventional farming. It’s also the reasoning behind non-animal factories. If you hand-made a shoe it would take time, lots of skill and you can only make a limited number of them. If you want bigger, better, faster, cheaper…you make a shoe factory in China. The only way to make bigger, better, faster, cheaper meat, eggs and dairy is to make an animal factory. That’s why we have metal barns holding thousands (or even tens of thousands) of the same exact animal under one roof. 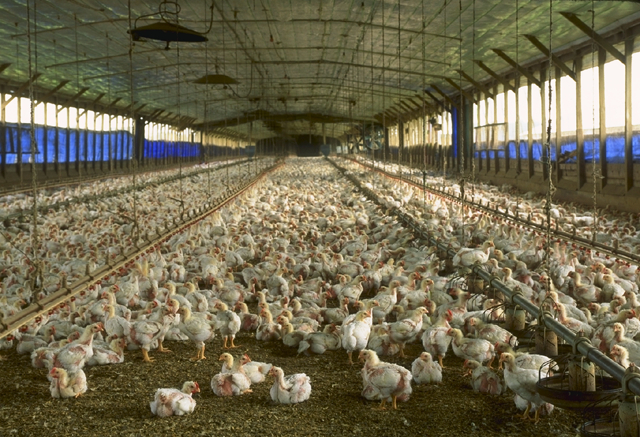 Here’s an example of a broiler chicken house compared to a pasture based poultry farm…guess which one is the factory. Automation: Automatic feeding and watering. Automatic lighting and temperature control. Automatic waste removal. Automatic everything. The factory farm is controlled by electronic circuits. The conventional farm has as much automation as any factory you’d see on an episode of How It’s Made. Consolidation & Control: “During the past 30 years the number of hog farms in the United States dropped from 650,000 to 71,000, yet the number of hogs remains almost the same.” via NRDC. Four enormous corporations produce 80% of the beef in America. Consolidation is the name of the livestock game nowadays. Chipotle’s commercial showed a small family farm being transformed into a large CAFO. This is very historically accurate. Consolidation under centralized control certainly sounds like factory farming to me. Factory Waste: A lot of non-animal factories produce hazardous waste. So, you’d expect a farm described as a factory to produce hazardous waste too, right? YEP! Hog farms keep this waste in enormous lagoons next to the hog buildings. Waste produced from hog CAFOs is quite toxic…but the factory farms will dispute this. Here’s a lovely rebuttal, “Large hog farms emit hydrogen sulfide, a gas that most often causes flu-like symptoms in humans, but at high concentrations can lead to brain damage. In 1998, the National Institute of Health reported that 19 people died as a result of hydrogen sulfide emissions from manure pits.” via NRDC. Sometimes this hazardous waste gets out of the lagoons and contaminates the environment in a dramatic way…exhibit A is Hurricane Floyd in North Carolina. You can learn all about factory farm waste here. Lack of Individuality: Dictionary.com says a factory is “any place producing a uniform product, without concern for individuality.” This doesn’t mean that animals are not cared for medically on an individual basis as needed. Far from it. Where I see “without concern for individuality” at work is how we respect the nature of the animals we’re raising. Factory farms put chickens in battery cages about the size of a piece of paper for their entire life. Hogs are raised on concrete or plastic slatted floors inside metal barns. You get the picture. 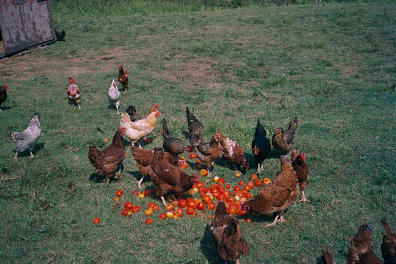 Factory farms don’t allow a chicken to express its chicken-ness as Joel Salatin would say. Factory farms don’t allow the hog to express its pig-ness. This is an insult to the individuality of the animals you are raising. At a non-factory pasture based farm like Polyface Farms in Virginia the animals can express their “ness” in every sense of the word. Conclusion: I could continue writing ad nauseum…but I’ll spare you. I haven’t even begun to address the remaining reasons why factory farming is unsustainable and not good for animals, consumers, the environment and workers all across the food chain. With today’s farm you have to ask yourself one question: what is the principle concern? Today, it is unequivocally how can we produce the most for the cheapest price. That, ladies and gentleman, is called a factory mindset. That’s why factory farming is an apt name. A CAFO is not a factory in the sense of a Ford or Toyota auto plant. But it is very factory-esque because the priorities are density of production, low cost, consolidation and automation. So, once again, is factory farming an appropriate name? Absolutely. The scene: My last day at a pediatric clinic. The nurses usually make some food for dinner because the clinic is open until 8pm today. They invited me to join them for soup. “I don’t understand organic milk?” A physician made this comment which sparked a mini conversation about animal welfare. My point is not to demonize anyone involved in this conversation. However, I think it’s very telling of the attitude towards animals and food among the majority of people in America. “It’s milk, isn’t it all organic?” No, it’s not. “Organic” foods don’t make sense to some people because they still have an early 20th century nostalgic view of what a farm used to be. Green pastures and a farmer in overalls leading his cows out to pasture and then hand milking them back in the barn. Things are not like this at all. This website describes what a “modern” dairy operation is like. The benefits of “organic” milk and other products are not clear to people because the assumption is that the status quo is a rosy picture. I’m here to tell you the status quo is an udder disaster. Terrible pun, I know. The status quo treats milk as a commodity. Make the most at the least cost is the mantra of the modern dairy conglomerate. We need happy cows raised on healthy land by caring farmers and farmhands. That’s the answer. Here’s a man, Francis Thicke, who operates a small pasture based dairy farm in Iowa. He’s being interviewed for Perennial Plate. The Perennial Plate Extras: Interview with Francis Thicke from Daniel Klein on Vimeo. “If it’s not a pet and it’s not a human…why do they care?” It’s a tough job convincing people that farm animal welfare is something worthwhile. I truly find it odd that farm animals “don’t count” when it comes to animal welfare in some people’s minds. Sure, the welfare of humans matters. Sure, the welfare of cats and dogs matters. But, farm animals? Come on, they say. Farm animals are for eating and their suffering doesn’t really matter. And are they really suffering? The short answer is yes, they are suffering given the factory farming conditions that are the “norm” in the U.S. And factory farmed animals are more polluting. They’re also less healthy for you. Want an example? How about all the antibiotics used in animal feed? How about all the arsenic used in chicken feed? How about when you crack a pastured local egg open it looks bright orange instead of the pale yellow of a supermarket egg? There’s lot of reasons to care even if farm animals are not your pet and are not humans. My hope is that people slowly start becoming aware of these reasons and then demanding change. The resultant change that must occur becomes self evident once the fallacies of factory farming become evident. If you’d like to read about real Kobe beef from Wagyu cattle you can do so here. They really are fed beer! I’m not going to be able to cover every aspect or potential counter argument in this post. And I’m going to be concentrating on corn that is fed to cattle because that’s the poster child for “corn-fed”. Let’s just get that out-of-the-way. But I’m going to try really hard to cover the important things! The 13.1 billion bushel 2009 U.S. maize crop was, according to the World Agricultural Supply and Demand Estimates Report by the USDA, used mostly for Livestock Feed. 5,525 million bu. were used for livestock feed which amounts to 42% of the maize crop. 1. Cattle reach slaughter weight faster when corn finished. 3. You can raise more corn-fed cattle on less land (i.e. feedlot) than letting them be pasture finished (i.e. that takes more land). This is all to say that corn-fed cattle are cheaper for the consumer and more profitable for the producer. Who can argue with that you might say? Isn’t that the goal of modern animal agriculture? Cheaper prices at the checkout and more profits for the producer…everyone wins, right? 1. Corn-fed beef just isn’t as healthy as grass-fed beef. Grass-fed beef has more Omega-3 fatty acids (the good ones), more Vitamin E, more beta-carotene, less saturated fat and calories and more conjugated linoleic acids (CLAs). CLAs are known for anti-cancer and cardiovascular benefits. Meat products from grass-fed animals can produce 300-500% more CLA than those of cattle fed the usual diet of 50% hay and silage, and 50% grain. 2. Corn has a little environmental problem. From an Environmental Working Group (EWG) article: “A new study released today by the US Geological Survey shows that efforts to reduce nitrate levels in the Mississippi River Basin are having little impact. Nitrates come mostly from the over-application of chemical fertilizers on crops in the Corn Belt, fouling streams and rivers and eventually helping to swell the annual Gulf of Mexico “Dead Zone.” The “Dead Zone” is roughly the size of Delaware and Rhode Island combined, around 3,300 square miles. The corn industry lobby tried to deflect claims that corn production is responsible for the “Dead Zone”…but EWG has pointed out how it’s nothing more than a cop-out. Read this fascinating response. 3. Currently, corn-based beef production is an unsustainable enterprise. We use oil for every aspect of production. Oil for fertilizer to grow the corn. Oil to transport the corn to the feedlots. Oil to transport the cattle from the pasture to the feedlots. Oil to transport the cattle to the slaughterhouse. Oil to transport the meat to your local grocery store. Oil, oil, oil! Guess what, an oil-based system is not sustainable! It’s going to run out and before it does the price will skyrocket given limited availability to the point that oil-based systems of production will be a laughingstock. 4. Subsidies. The government doles out billions every year in subsidies to corn growers. This means that corn-production and subsequently any industry that relies on cheap corn is built on a house of cards. Take away the subsidies and the business model fails. The house falls down. EWG has calculated that corn subsidies from 1995-2010 totaled 77.1 BILLION DOLLARS! Why are we subsidizing an unsustainable industry that produces meat that is less healthy for people? Corn is produced for less than the real cost to grow it. What other industry enjoys such a luxury? If I wanted to start a small organic vegetable farm you can bet I wouldn’t be getting any subsidies to help me out. 5. There’s nothing “natural” about the conventional corn-finished feedlot way raising cattle. You see a lot of meat packages in the grocery store that say “all-natural” but all that means is that it meets the USDA definition of “natural” which is “A product containing no artificial ingredient or added color and is only minimally processed. Minimal processing means that the product was processed in a manner that does not fundamentally alter the product.” What’s “natural” about feeding cows harvested corn? What’s natural about using lots of fertilizer and chemicals to grow that corn? What’s natural about using millions of gallons of oil to support the whole system? What’s natural about making a product which is less healthy than what the real natural grass-based system would give us? Cattle have evolved to eat and digest grass which has grown free of man-made input thanks to the energy of the sun. So, why do we spend hundreds of millions (if not billions) of dollars on artificial fertilizers, chemicals and everything else it takes to grow lots and lots of corn that we feed to animals? Why do we use so much oil to make food for cattle when all the food they would ever need grows naturally without any other input than the sun and a little rain from above. Interestingly enough, cattle can graze standing corn. After all, corn is a type of grass. This can be used to take some of the stress off the pasture. But this is a far cry from growing corn and harvesting it so that it can be the exclusive feed of cattle in the feedlots. A lot of people will counter that if we switch to grass-based systems, if we do everything you’re talking about then you have to choose which people in the world will starve to death as a result. I’d like to counter that line of reasoning with two points. First, we don’t have a global food shortage problem, we have a global food distribution problem. Second, people are already starving to death and I’m not aware of any goodwill programs from major animal agriculture companies that are trying to address that problem. We sure could make better use of grains by giving them to poor people than by feeding them to cattle so we Americans can have cheap meat for breakfast, lunch, dinner and a snack every day. Yes, at least initially, pastured meat products will cost more. I think that, along with any kind of change, scares people. It scares them into thinking, “What if meat costs more and I have to eat less of it?” People like meat, duh. But we Americans probably eat way too much of it. It’s no longer a special part of a meal. It is the meal. While I don’t think machines (i.e. the ones that took over in The Matrix) are the answer to our uniquely human problem. I do think it’s necessary to ponder that perhaps we’re over-consuming meat. We’ve taken the amount of meat that nature will provide for us with natural systems and twisted in to factory farming to give us more. We do whatever it takes to get more for less. Shouldn’t we be thinking that less can be more? I think so. Why do we spend billions of dollars countering a grass-based system that God has given us and try to replace it with an unnatural oil and corn based feedlot factory farm system? Like I’ve said before, I’m not an absolutist. So, if people just can’t part with “corn-fed” taste then I would be fine with the product as a specialty “every-once-in-a-while” treat that would cost more. And only if it wasn’t part of a factory farming feedlot system. If farmer John wants to raise a few corn-fed cows beside the majority of pastured cows that would be OK with me. Using a pasture grass-based production system is about what’s right, not what’s status quo for a multi-billion dollar industry that sees a lot of money ending up in the hands of shareholders and CEOs and delivering us ever-increasing amounts of meat for less money. When all you consider is “How do we make this cheaper?” things start taking a back seat to that all-consuming goal of “cheapness.” I don’t know about you, but I don’t want a food system to be based on what’s cheapest. I’d like it to be based on what’s right. Additional Note: I’ve been concentrating on beef cattle livestock feed. If I covered every aspect of corn used for livestock feed I’d write a novel. But, I thought you should know that a large portion of corn does go to hog production, dairy cow production and chicken production. Virtually all of these systems are also factory farm “bigger, better, cheaper” systems that are heavily oil-dependent, use animal-confinement and there is nothing “natural” about these systems. These animal products can also be part of a bigger grass-based system. Perhaps no one does grass-based better than Joel Salatin. He explains it in under 3 minutes in this must-watch video. 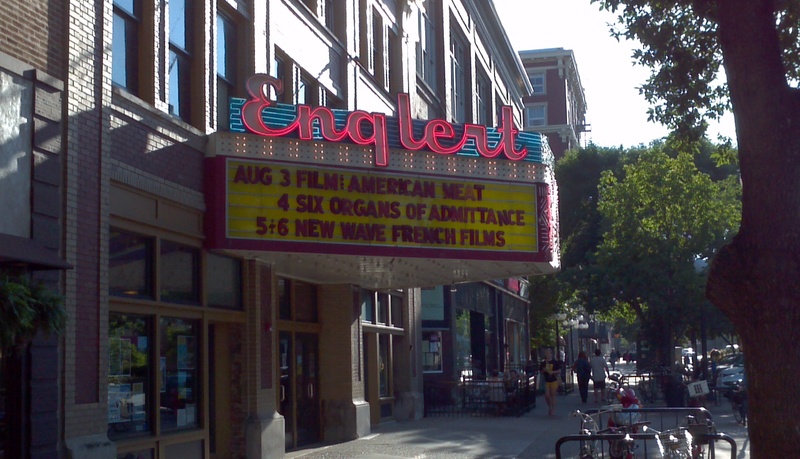 My wife and I have the chance to see a screening of the documentary “American Meat” this Wednesday in Iowa City, IA. I’m super excited and I promise to write about the documentary as soon as I’m able! For now, you can go watch the trailer on their website and get a glimpse of the issues that will be discussed in the documentary. Check back soon! If you believe Republicans in this country you’d think the answer to all our economic woes is “free market economics unhindered by government regulation” — I’d say you’re wrong. It’s not hard to see that the factory farming system is the result of unfettered free market capitalism. Free market “competition” will drive the price of meat and animal products down over time. While that might sound like a good thing…consider the following. Driving the price of meat and animal products down over time is not the only goal; the additional goal is to enrich the shareholders and executives at the company. The way the price of meat goes down while still skimming enough off the top to appease shareholders and CEOs/VPs is lower wages, less worker benefits, poor working conditions, less worker rights, intensive animal confinement practices and whatever practice will be cheaper. The “profit motive” is a very blinding concept that drives corporations to ignore animal welfare in the pursuit of better quarterly earnings reports. That’s the trouble with capitalism. Capitalism in its most raw form is a dangerous animal. To borrow a phrase from one of my Radiology professors, “It’s a dog eat dog world out there and I’m wearing milk bone underpants.” And it is a dog eat dog world in capitalism. Sometimes it’s not pretty, e.g. 2008’s Great Recession. If you find yourself wearing the milk bone underpants capitalism might eat you alive. Luckily we have some regular cotton underpants…I call that regulation. And until I or someone smarter than me figures out a Utopian economy that can sidestep capitalism then we’ll have to settle on regulation as a safety net for the failings of capitalism. One of my top priorities when envisioning the future of animal agriculture is government regulated animal welfare laws. And I’m talking about tough laws. Laws that any decent human being would find necessary and prudent, but corporate food companies like Tyson and Cargill would find objectionable. If companies like Tyson and Cargill aren’t complaining about the new laws, you know they aren’t tough enough. If they are complaining…you’re on the right track! Assignment: Nada…take the night off!